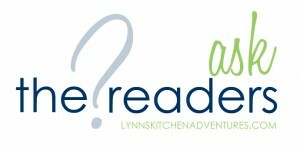 This week I am opening up Ask The Readers to you. What would you like to ask me? Is there anything you want to know that I have not shared yet? Or maybe something that you would like to know more about food or me? Go ahead and ask and I will try to put them together and answer some of them next Saturday. Please let us know the measurements on sugar to substitute sugar.. If where using yeast from a package and your recipe calles for 2 tsp how many packages do we use..
1) any and all homemade mixes that can be made in bulk and stored in the pantry, making for a cheaper and healthier quick alternative. 2) tips on what sugar’s are best for what uses ie: baking, mixing into recipes for quick dissolving, cooking with. Also, which sugar’s are a healthier alternative and the best health wise to traditional white sugar. 3) any other easy, budget conscious ways to improve our families intake of healthy foods, less processed foods, no HFCS, less sugar, etc. I buy Sucanat sugar from the Bread Beckers website. Rapidura is another name for Sucanat or unrefined sugar. This kind of sugar actually has nutrients and supposedly doesn’t cause the spikes in glucose levels like table sugar. Why greese & flour pans when baking. I’ve always only greesed my pans and they turn out fine. Should I be flouring them also? I love making apple pies and was wondering if you have a recipe for gluten-free pie crusts. You seem to use your crock pot a lot (which I would like to do more of…) so how about some “basic rules” for using the crockpot? How long are canned foods good for once opened? I’ve tried several recipe’s that call for condensed milk and canned pumkin, but do not use the whole can. I hate to throw the remainder away. How long are they good for in the fridge? I put them in a plastic container, label and date them and do not store them in the metal can. My usual is throw items away after a week in the fridge, but some things are good for longer. Do you know or is there a web site that tells us?